You can use CSS pseudo-classes to create CSS buttons. Before CSS, you needed images to create links that looked like buttons. First, set the appearance of the button in a style definition for the a tag. The following code creates a block around the text that is a light-green color (Saltpan) with specified fonts and font size, as well as margins and borders. Next, add the pseudo-classes for what the text will look like when it's hovered over and active. 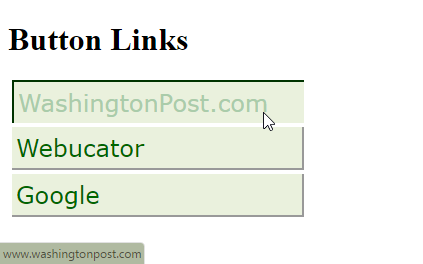 And now you have what looks like buttons for your links.